MIDTOWN, Manhattan -- The Brooklyn rapper Desiigner was charged with gun and drug possession following a road rage incident overnight Friday. Police say the 19-year-old was stopped over a dispute that appears to have started in the Lincoln Tunnel around 1 a.m. He allegedly displayed a weapon to the driver of another vehicle as the two exchanged words, and the other motorist called 911 and gave a description of the rapper's white Range Rover. Police quickly caught up with the SUV and reportedly spotted various drugs plainly visible in the console. Authorities say the drugs appeared to be Oxycontin, and a loaded firearm was also recovered. The artist, whose real name is Sidney Royel Selby III, was charged with criminal possession of a weapon, criminal possession of controlled substance with intent to sell and third-degree menacing. Four other people in the SUV were also arrested and charged. 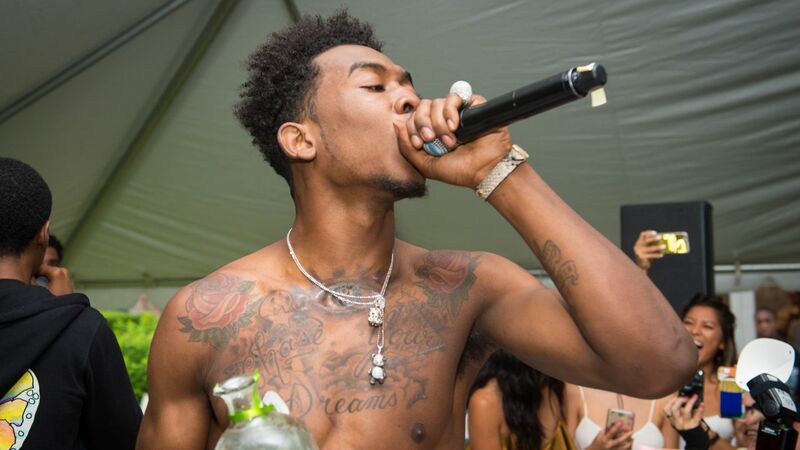 Desiigner is known for his hit song "Panda" and has collaborated with Kanye West.